It’s a question I often get asked, so how come you, a Brit, work in the wine industry in Spain? I studied languages at University but it wasn’t until I spent a year teaching English in a tiny village in Navarra that it clicked. I spoke Spanish and French, loved anything to do with cooking, eating or drinking and now had a new passion for white asparagus and Rioja wine. I graduated from my languages degree, spent a year studying languages and business in France (completing my final project on exporting Bordeaux to the UK) and then applied to do work experience at a wine importers in the UK. I spent a few months in the marketing department of Berkmann Wine Cellars before hearing of a junior position at leading food and drink PR agency, Phipps PR. I ended up spending 8 years there, working my way up to a board position as Account Director, handling integrated marketing campaigns for major clients including Wines of Germany, Wines from Rioja, Champagne Lanson, Green and Black’s Organic Chocolate and Kettle Chips. I also studied with the WSET, passing the tasting and theory exams of the level 3 advanced certificate and level 4 diploma in Wine & Spirits. I organised London’s first wine and tapas festival – Rioja Tapas Fantasticas – an event which was named the best generic marketing campaign in 2010 and 2011. I loved my job but also yearned to move back abroad, so when I heard of a position in the marketing department of one of Spain’s largest winery groups based in Madrid, I jumped at the chance. After a few years working as Brand Manager, I had my first son and decided to make the shift to self-employment creating Taste Exchange to offer specialist marketing, communications and translation to the wine industry. Working with a crack team of designers, photographers and other marketing, copywriting and events specialists, I’m proud to say that Taste Exchange has delivered cost-effective and on-point marketing campaigns and events for a number of clients such as Bodegas Frontonio and Roca Madre – an association of artisan wineries including Viña Zorzal, Almaroja, Quinta Milú and Celler Pardas. 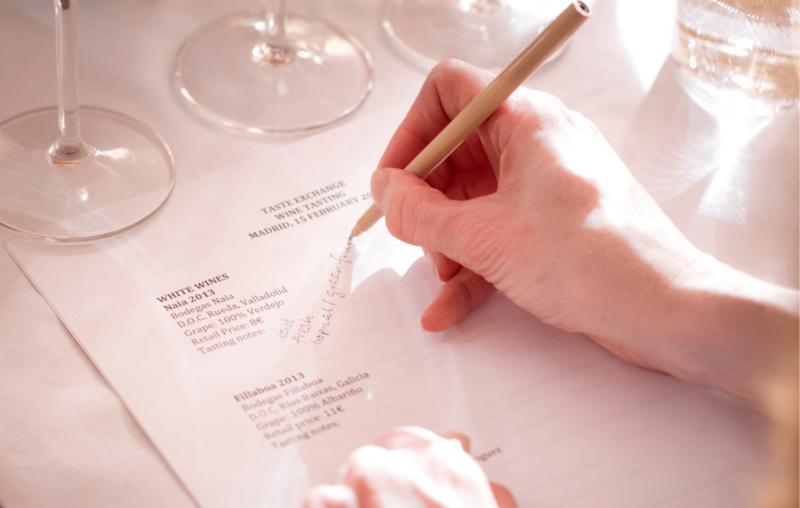 We’ve also translated special wine content including technical information sheets, websites, blog posts and marketing presentations for major wineries including Bodegas Osborne and Bodegas Palacio. The retained agency for Long Wines, Taste Exchange manages their marketing activity on an external basis, writing the news for their website and newsletter, managing launches of new wines, and producing marketing content and materials for some of their key brands. I also contribute as a writer for Spanish Wine Lover, and am now a certified WSET tutor, teaching WSET courses in Spanish and English to level 3.